PrivateVPN offers great speeds, gets around Netflix restrictions, and it's available at a good price. Every VPN service under the sun promises fast download speeds, but few can actually guarantee them. One service that truly delivers the goods (at least in our tests) is Sweden-based PrivateVPN. This simple and easy-to-use service has something for everyone. 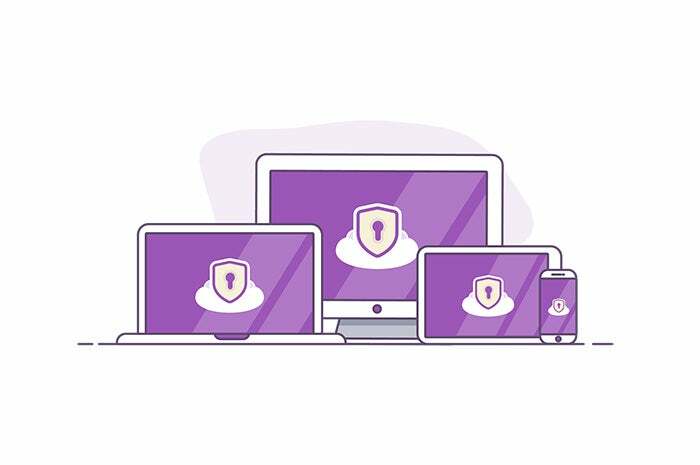 It offers a high degree of complexity and choice for VPN users who want it, as well as a far simpler interface for those new to VPNs. Beyond speeds, PrivateVPN promises Netflix access in several countries, as well as access to Amazon Prime Video and Hulu. PrivateVPN offers two modes: Simple and Advanced. The simple mode is the first thing that all users see. This interface offers a single-pane window that is not adjustable. It has a drop-down menu and a Connect/Disconnect button, as well as an indicator towards the bottom that shows whether you’re connected to the VPN. Click on the drop-down and you can pick from PrivateVPN’s more than 100 servers in 56 different countries. PrivateVPN offers specific servers for Netflix and other specialty services, which are indicated in the drop-down menu. Beyond that, PrivateVPN doesn’t offer any other details about its servers. For instance, it would be nice to see information such as ping time for each server from your location, or how close to capacity each location is. After you’ve picked the server location you want, click Connect and you’ll be up and running. Once you’re connected, your new IP is displayed in the middle of the window. 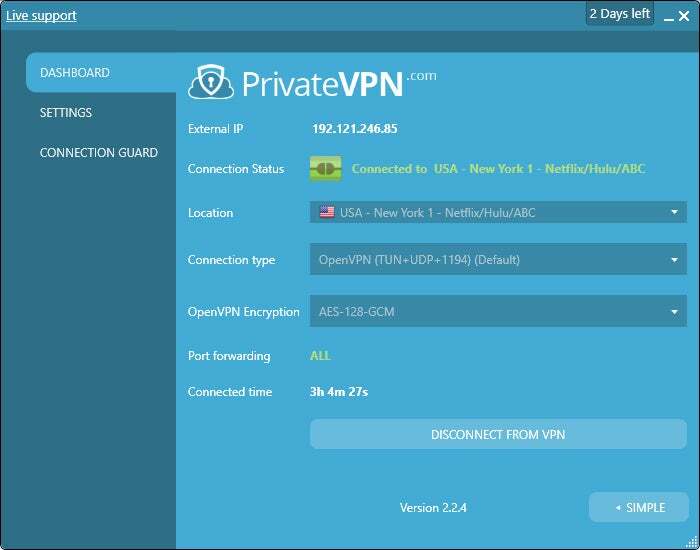 If you’re a basic VPN user, that’s about all you need to know to use PrivateVPN. Experienced users, however, can click the Advanced button in the lower-right corner of the window to see a larger dual-pane interface. The dashboard in PrivateVPN’s Advanced mode. The left-hand rail offers three choices: Dashboard, Settings, and Connection Guard. The Dashboard allows you to pick not only the location, but the type of VPN protocol to use, as well as the level of encryption for OpenVPN. The Settings section lets you adjust various options, most of which are not enabled by default, such as booting PrivateVPN on system startup, connecting automatically on startup, and reconnecting automatically on connection failure. 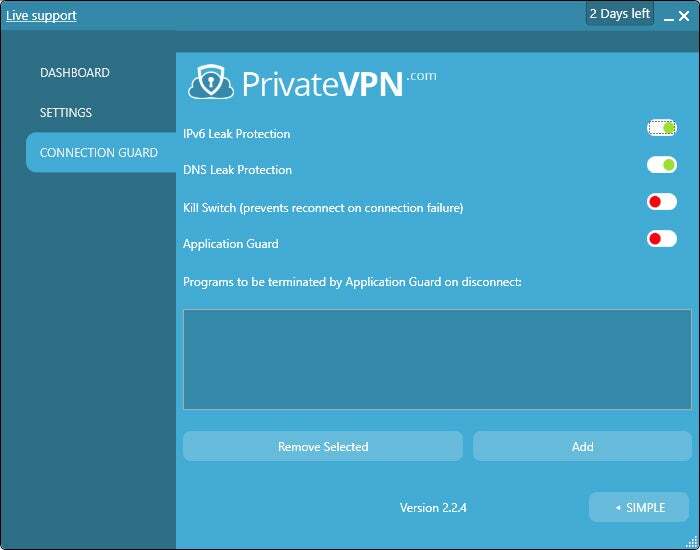 Connection Guard houses options such as IPv6 and DNS leak protection, an internet kill switch (enabled by default), and an application guard that disconnects certain apps when the VPN connection drops. As for PrivateVPN’s Netflix promises, there are servers to access Netflix in the U.S., UK, Canada, Germany, and Italy. All of these options worked as advertised, but as always, this could change at any moment given Netflix’s adversarial stance towards VPNs. PrivateVPN charges $50.40 for 13 months at this writing and allows six simultaneous connections per account. The service offers apps for Windows, Mac, Android, and iOS. PrivateVPN was very fast in our tests. The service retained 50.52 percent of the base speed across five locations. That doesn’t put PrivateVPN in the top spot for speeds, but it’s definitely one of the fastest services we’ve tested. The only downside is that in my tests it took a little long to actually make a VPN connection, so be prepared to wait when you switch servers with PrivateVPN. Payments are accepted via credit card, PayPal, and Bitcoin, allowing for varying levels of pseudo-anonymity. PrivateVPN is owned by Privat Kommunikation AB, which has a business address of Bygdevägen 5, 191 48 Sollentuna, Sweden. The company chief is Martin Müller. 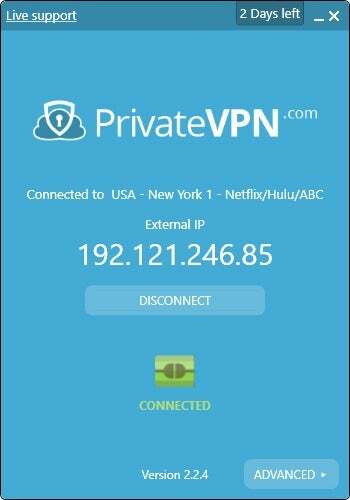 PrivateVPN is a fantastic choice for VPN speeds, Netflix access, ease of use, and flexibility for power users. At $50 per year it’s also well priced. It would be nicer if you could pick locations based on ping speed or server availability, but that’s hardly a deal breaker. The number of servers could also be a little larger, but currently that is not presenting a problem for speeds or connection availability.